Two-thirds of the illegal immigrants removed from Prince George’s County under a federal program designed to identify and deport dangerous criminals had no criminal records, giving rise to charges that county police are targeting Hispanics for arrest and deportation. Illegal immigrants who have no criminal records are being deported from Prince George’s County at a higher rate than all but one other jurisdiction in the nation, Jefferson Parish, La., and far more than any other locality in the Washington area. Of the 223 illegal immigrants deported from the county under the Secure Communities program between December 2009 and February, 145 of them, or 65 percent, had no criminal record beyond their immigration violations. In Arizona, the state with one of the country’s toughest immigration laws, less than 28 percent of those deported by Immigration and Customs Enforcement were noncriminals. A Prince George’s police spokesman, Cpl. Evan Baxter, declined to comment, saying ICE, not the department, runs the program and determines who is deported. Florinda Lorenzo-Desimilian of Langley Park was among those arrested by Prince George’s County police and now faces deportation for what even the courts agreed was a minor criminal offense, selling phone cards out of her home. Lorenzo-Desimilian was arrested with nine others in a police sting and charged with a misdemeanor for selling the cards without a business license. As a part of her plea, she was ordered to perform 16 hours of community service. When Lorenzo-Desimilian’s fingerprints were turned over to ICE, however, authorities determined that her visa had expired and on Tuesday the 27-year-old mother of three, two of whom are U.S. citizens, will face her third deportation hearing. She could be forced to return to Guatemala, leaving her family behind. Prince George’s County Executive Rushern Baker said the county abides by the rules of the Secure Communities program, which requires that fingerprints taken by local police of anyone they arrest to be passed along to federal immigration officials, who check their legal status of the arrestees before instigating deportation proceedings. “Mr. Baker and his staff will be vigilant and monitor [the program] for abuses and will continue to encourage the state and federal government to find a solution allowing opportunities for those desiring citizenship in our country,” said Baker’s spokesman, Scott Peterson. Advocates for immigrants say the Secure Communities program is encouraging police to make arrests based on racial profiles. “A program that’s about our public safety probably shouldn’t be deporting residents with outstanding parking tickets or for driving without a license,” B. Loewe, spokesman for the National Day Laborer Organizing Network. Local officials say they are only enforcing the law. 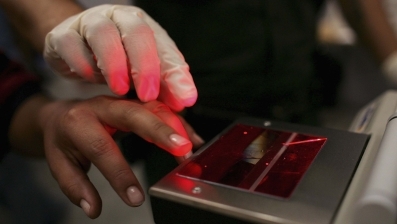 The county submitted to ICE the fingerprints of more than 25,000 people who were arrested since December 2009 and 223 were deported, a decision made exclusively by ICE, said Mary Lou McDonough, director of the Prince George’s County Correctional Center. ICE officials said that while the Secure Communities program was designed to identify and deport those with criminal records, the agency can’t ignore those who may not have committed serious felonies but are in the United States illegally, as is the case with Lorenzo-Desimilian’s expired visa, which is itself a federal crime. “ICE prioritizes the arrest and removal of criminal aliens who pose a threat to our communities,” ICE spokeswoman Cori Bassett said. This entry was posted in Press (Maryland) on April 12, 2011 by Ian.